Puncturing constantly the fingers for the measurement of glycaemia leads to the thickening of the fingertips skin in more than half of people with diabetes. As a result, there is often a loss of sensation accompanied by pain in these areas, the formation of micro trauma and strong exposure to local infections. 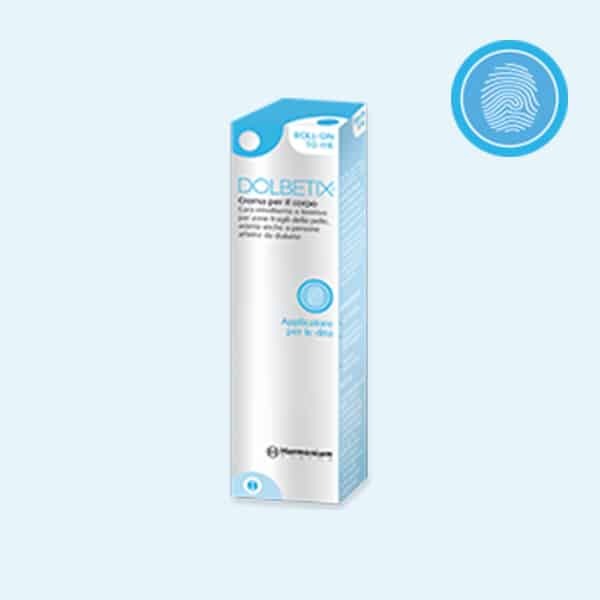 DolBetix is the first topical product specific for the prevention and treatment of injuries to the fingertips. Thanks to the synergistic action of its ingredients, DolBetix provides immediate soothing sensation of freshness and effective repair of skin damage originated by the repeated use of lancets. Thanks to a metal roll-on applicator specific for the fingers, DolBetix can be applied several times a day as needed by sliding the roll-on on the fingertips. Dermocosmetics for dry skin: a new role for botanical extracts.-Casetti F, Wölfle U, Gehring W, Schempp CM., Skin Pharmacol Physiol. 2011;24(6): 289-93.
Review of the pharmacological effects of Vitis vinifera (Grape) and its bioactive compounds. – Nassiri-Asl M, Hosseinzadeh H., Phytother Res. 2009 Sep;23(9):1197-204. Effect of Rosa rubiginosa (Rosa moschata) oil on the healing of open wounds. – Marchini F, Martins D, de Teves D, Simoes M. de J., Rev Paul Med 2006; 106 (6): 356. Studies on the anti-inflammatory activity of phytopharmaceuticals prepared form arnica flowers. – Klaas CA, Wagner G, Laufer S, Sosa S, Della Loggia R,Bomme U, Pahl HL, Merfort, I. Planta Med 2002; 68 (5): 385-391.